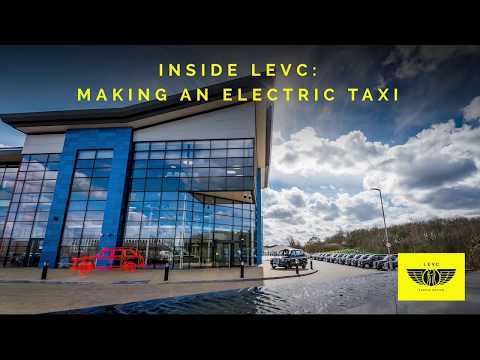 If you’ve ever wondered how an electric taxi is built, or what takes places inside 31,000 m2 of manufacturing space, join us as we take you Inside the world of LEVC. Through pictures, videos and interviews with staff, we’ll take you on a behind-the-scenes tour of our electric vehicle manufacturing plant at Ansty, Warwickshire. From robotic machining to state-of-the-art laser tooling - find out how we build electric vehicles the LEVC way. Built from scratch in just over a year, our state-of-the-art manufacturing plant represents an investment of more than £300 million, and a commitment to making the cities of the future a cleaner environment through the electrification of urban transport. Housing a research and development centre, as well as manufacturing, quality and testing facilities, our new Headquarters became the UK's first plant dedicated entirely to the production of electric propulsion vehicles - and the first manufacturing plant to be built in over 10 years. Innovative building design and sustainable initiatives help minimise our energy demand and carbon footprint; making the entire premises an exemplar of energy efficiency. The Headquarters and plant received an 'Excellent' rating from BREEAM - the world’s leading sustainability assessment method for buildings which, among other criteria, score a building on energy demand, energy consumption and CO2 emissions; as well as an A Energy Performance Certificate (EPC) rating - a Governmental guideline that scores the energy-efficiency of a building. Reducing the energy needed for lighting is paramount as we work towards sustainable manufacturing. Throughout the production halls innovative roof design and glazing maximise daylight, achieving 15% roof lighting. A 81m2 glazed wall delivers diffused daylight on to the assembly line, and gives passersby a clear window into the world of the LEVC. The introduction of natural light creates an appealing daylit working space and crucially, by daytime allows us to dim the lighting to our reduce energy demand. As well as the numerous health & well being benefits, the introduction of natural daylight helps reduce our energy demand. All vehicles are drenched for five minutes at two water pressures to ensure a water-tight seal. Intricate rainwater harvesting systems repurpose 'run-off’ rain water from across the premises. 750,000 gallons of rainfall is collected through guttering and channeled to an underground storage tank, where it's kept for use independent from the main water supply. Collected rainfall serves a multitude of tasks around the facilities, from use in vehicle leak testing, to flushing toilets and washing vehicles; enabling us to reduce our demand on the mains water supply. 365 photovoltaic solar panels adorn on the roof, catching the sun's energy and converting it into electricity which is used to power machinery and lighting across the premises. This clean, renewable source of energy helps us further reduce our carbon footprint. Sophisticated VRF (Variable Refrigerant Flow) and heat recovery systems are deployed in the office spaces, recovering waste heat from around the building, and using it to heat other rooms and water. Because the refrigerant flow is regulated based on need, these systems are more energy-efficient, again reducing our carbon footprint. Photovoltaic solar panels generate green electricity from sunlight which is used across the premises. Thanks to an integrated production strategy, our flexible assembly line is capable of producing multiple vehicles on the same track; enabling us to switch between manufacturing clean, zero-emission capable taxis and vans with ease. At full capacity the line is capable of producing 24,000 electric vehicles each year. Now on their own wheels these taxis line up on the Slat Track for final assembly. As a home to over 500 staff and state-of-the-art machinery, it's important that productivity and well being are aligned. All 31,000 m2 of the production area, and 7,000 m2 of office space spread across three floors, have been designed in accordance with Feng Shui and philosophical system; an ancient Chinese practice which guides the design of an working space so it brings out the best of those who operate in it. The ancient practice of Feng Shui has been adopted to optimise the environment we operate in. Follow us on online social media as we delve deeper inside the world of LEVC. Discover exactly what takes place at each stage of the vehicle production process. Of course, being 'People Driven', our people are at the core of our business. In this section we'll also bring bring you closer to individuals delivering our sustainable vision; from the staff with decades of experience to those embarking upon a new career in the STEM sector, we'll tell the stories behind the people of LEVC. Over 3,000 pallet locations are spread across 20 aisles, each a dizzying 10 metres high. The latest robot adhesive systems ensure the exact shape, length & cubic centimeter of adhesive is applied to the vehicle glass. This taxi is suspended on the Electric Monorail System (EMS) awaiting fitment of underbody systems.